They say New York is the city that never sleeps, but it's not as if Chicago, London and Beijing hunker down for an eight-hour kip at 12am. 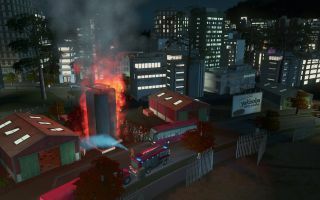 In each one, a big invisible godcursor is managing traffic, rubbish, buses and crime, and in Cities: Skylines' upcoming expansion that could be you. After Dark, as mentioned previously, has more neon, one more moon, and slows the pace of the game to reflect that fewer people are out and about. At this weekend's PAX Prime, developer Colossal Order released a trailer to show a night-time city in action. The above is in-game footage, but it doesn't show a person actually playing it—still, you probably know by now what that involves. After Dark is out September 24, and it looks pretty damned relaxing. I like the thought of flying over a tranquil night-time city, occasionally prodding at wind turbines and recycling trucks.